Here at Trans Tech we pride ourselves on using the most robust & reliable parts in the industry. From our Versa slide track seating system, our state of the art plug and play electrical control system and our skeletal steel body cage every part that makes up a TransTech bus provides safety, quality and reliability. FLOOR - Floor consist of 14-gauge G-90 galvanized steel transverse hat section cross members, secured to the chassis frame by isoprene rubber isolators using grade 8 bolts. The side perimeter of the floors is then reinforced with 16-gauge G-90 galvanized crash rails which encapsulate the ends. Some of the benefits from this are it uses fewer parts, less body seams, longer life, better corrosion protection and reduces water infiltration points. 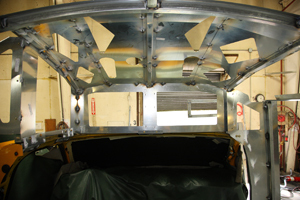 BODY AND BOW STRUCTURE - The roof bows and side posts are combined in one piece of continuous roll-formed hat section 14-gauge G-90 galvanized steel and are bolted into the impact panel with four bolts on each bow. 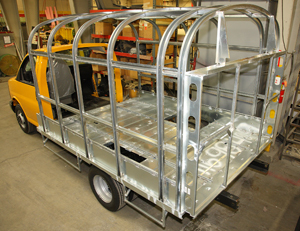 Lower perimeter impact panels run the full length of the vehicle, encapsulate the ends of the floor frame cross-members and are welded in place for extra security. Vertical impact panels are welded to the seat level all track for enhanced safety during side impact events. 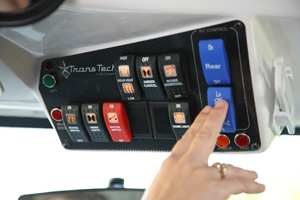 The cab-over panel frame design results in improved distribution of stress loads to multiple cab attachment points. 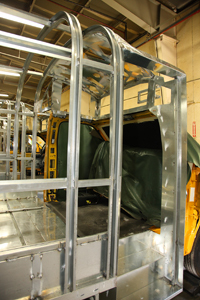 Better cab over roof support structure and superior fit and finish of cab over body frame components. There are seven rows of longitudinal strainers made of 14 gage G60 galvanized steel. Bolted to floor to floor body bows, they enhance performance in virtually all situations from the stresses of a catastrophic incident to day-to-day stress load. The body and body bows are each fully insulated with fiberglass insulation. The window post cover is bonded to the body bow and adds structural support to the body. Anodized black finish to match the bus windows giving it a continuous blackout window effect and enhanced styling. Bumpers are poly coated with a beaded edge for added strength. This makes them highly impact resistant and flexible. Some of the benefits of this are reduced corrosion, maximizes structural integrity in body attachment, prevents stress risers or cracks due to stress risers and is easier for field service, reduces water infiltration. SEATING - The seat frames are tubular steel, 1" diameter and black powder-coat to resist rust and abrasion. The seat cushion foam is attached to a plywood base, and covered with transit grade 42-once fire resistant vinyl. Cushions are removable from the seat frame by releasing the latch beneath the cushion. All passenger seats are mounted using our versa track seating system Welded into the body made up of high strength low aloe galvanized steel adding another structural beam at the impact zone and uses steel inserts that lock the track into the floor. 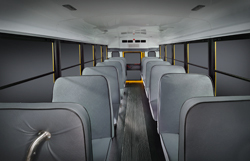 All seats installed by Trans Tech Bus comply with all applicable Federal Motor Vehicle Safety Standards in effect at the time of manufacture. Some of the benefits are it reduces corrosion points, adjustable seat spacing while in the field, add or remove seats easily, no floor penetration, reduces water infiltration and is certified for all seating designs. RUB RAILS - Two polyurethane painted rub rails are installed on each side of the body at seat level and floor line level. These rub-rails are mechanically-fastened twice to each vertical post and upright body member. All rails are vented to prevent condensation leading to rust, and to promote air circulation. Rails are pre-primed with an epoxy primer prior to attachment to body. Seat level rails wrap around the rear corners of the body and extend to the emergency door opening. One major benefit is that separate rub rails allow for easier and better service. REAR CAPS - the rear caps are made of molded fiber glass and attached with stainless steel screws. They provide a reduction in body seams and improved styling. There is also an optional lighted school bus ID sign which is made up of a translucent decal over a fiber glass cap and backlit. This design helps protect against water leaks in the sign area.